EN 60836 ed. 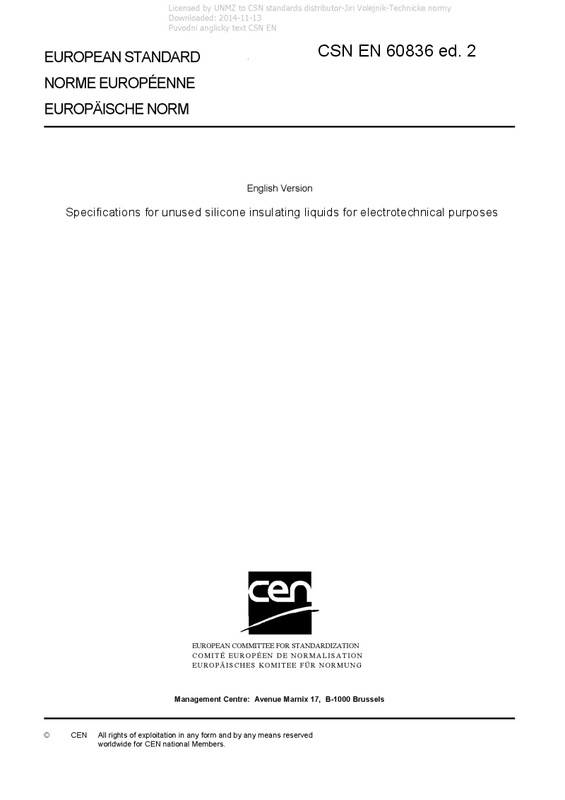 2 Specifications for unused silicone insulating liquids for electrotechnical purposes - IEC 60836:2015 covers specifications and test methods for unused silicone liquids intended for use in transformers and other electrotechnical equipment. Besides the standard transformer applications there are other applications of silicone liquids, such like cable accessories, capacitors, electrical magnets etc. This edition includes the following major technical changes with regard to the second edition: a) classification of liquids according to IEC 61039 have been adapted with respect to the latest edition of IEC 61039:2008; b) classification of liquids according to IEC 61100:1992 have been removed as IEC 61100 has been withdrawn; c) minimum requirements for other silicone liquids for electrotechnical purposes have been added.